Carnival Cruise Lines has made itself into one of the most trusted cruise lines in the world. Embark on a vacation with Carnival Cruise Lines and enjoy many types of delightful on-board amenities, a catering service staff, and a truly impressive fleet. 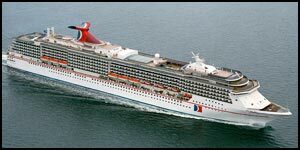 RedHotCruises provides a huge assortment of cruises with Carnival Cruise Lines at unbeatable prices. Below, you can see all destinations, departures and ships available with Carnival Cruise Lines. Vacancy is very limited, so reserve online with us as soon as possible to ensure your cruise with Carnival Cruise Lines before it sells out completely. Contact us at (844)235-4177 or email us to talk with a cruise pro and we will find the perfect cruise for you.